About Us - Glittering Star 322 I.C. The regiment was raised in 1694 by Colonel Thomas Farrington, an officer of the Coldstream Guards during War of the Grand Alliance known in America as King William’s War. It was disbanded in 1698 after the Peace of Ryswick and reformed in 1702 for the War of the Spanish Succession, also known as Queen Anne’s War. 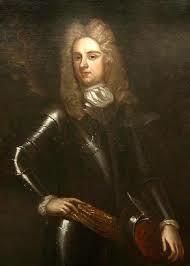 The regiment served under John Churchill, 1st Duke of Marlborough at the victorious Battle of Ramillies in 1706 against the French in what is now Belgium and in the siege of Ostend. In 1727 the regiment saw action at Gibraltar and were sent to Fortress Louisbourg on Cape Breton Island in 1745. In 1749, the regiment was at the site of Halifax, Nova Scotia, where the soldiers cleared the land for the new town. An altercation with some Native Americans led to an order that all officers in the regiment must always be armed, thus earning their first nickname as the “Ever Sworded” due to the swords the officers are required to wear even when off-duty a tradition still in effect today as the orderly officer is still armed even at the officers mess. In 1751, the regiment received the new designation as the 29th Regiment of Foot, when the British Army went to numbers instead of colonel’s names for regiments. In 1759 Admiral Lord Edward Boscawen gave to his brother Colonel George Boscawen 10 black youths he acquired in the capture of Guadeloupe from the French in the same year. These young men were released from slavery and joined the regiment as drummers, a tradition the regiment continued until 1843. These men received the pay of a corporal and if they survived to retire received a pension from the army. Glittering Star Masonic Lodge While at Kilkenny, Ireland, a Warrant No. 322 from the Grand Lodge of Ireland, dated 3rd May 1759 was issued for a Masonic Lodge in the 29th Regiment of Foot. The Glittering Star Travelling Masonic Lodge is still closely associated with the Regiment. 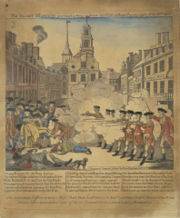 Boston Massacre In 1768 the 29th along with the 14th Regiment of Foot were sent to Boston, Massachusetts, where on the evening of March 5, 1770, men of the 29th Grenadier Company under the command of Captain Thomas Preston took part in the Boston Massacre in which five colonists died during a riot in front of the Boston customs house. Due to the incident, the regiment earned the nickname the Vein Openers for drawing first blood in the American Revolution. The men involved were tried for murder and were defended by John Adams (who later became President of the United States). Two of the men involved, Hugh Montgomery and Matthew Killroy, were found guilty of manslaughter and branded on the thumb. Captain Thomas Preston and the other men involved were found not guilty. The 29th left Boston in 1771 for British controlled Florida before returning to England in 1773. American Revolution Early in the spring of 1776 during the start of the 2nd year of the American Revolutionary War, the 29th Regiment of Foot under the command of Lt. Col. Patrick Gordon was sent with other British regiments to relieve the siege of Quebec City by an American army. On July 25 Lt. Col. Patrick Gordon was shot and mortally wounded by Benjamin Whitcomb of Whitcomb’s Rangers, Lt. Col. Thomas Carleton of the 20th Regiment of Foot was then promoted to command the 29th. After pushing the American army down the St. Lawrence River at the Battle of Trois-Rivieres, men from the battalion companies served on board the ships of General Guy Carleton, 1st Baron Dorchester in the Battle of Valcour Island on Lake Champlain on October 11, 1776. In 1777, the Light Infantry Company and the Grenadier Company were with Lt. General John Burgoyne as he headed down from Montreal to Saratoga. Both the Light Infantry Company and Grenadier Company saw action at the Battle of Hubbardton under the command of Brigadier Simon Fraser, as part of his Advance Corps on July 7, 1777. Both companies surrendered with the rest of Burgoyne’s Army after the defeats at Battle of Freeman’s Farm and Battle of Bemis Heights in September and October of 1777. The other eight Battalion Companies remained in Canada and took part in raids and small battles along the Vermont and New York frontiers during the rest of the American Revolution led by Major Christopher Carleton and Lt. John Enys. In 1781 the 29th was linked to the county of Worcestershire in England, giving them a recruiting area and home. The 29th Regiment returned to England in 1787. For more details on the raids along Lake Champlain and the upper Hudson Valley see Carleton’s Raid (1778) and Burning of the Valleys.